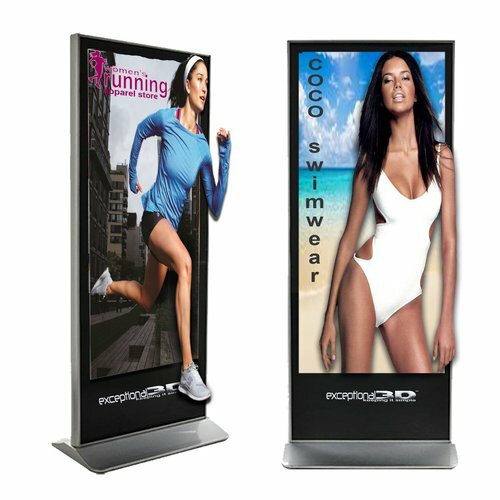 Exceptional 3D, a glasses-free 3-D display company, has launched three 3-D displays for digital signage. The products include the 32-inch Glasses-Free 3-D 4K Portrait display and the 58 and 85-inch Glasses-Free 3-D 4K kiosks, according to a press release. The kiosks are designed to support ultra-thin displays and integrated media players. Exceptional 3D will also provide all end-users with training on how to use 3-D content. “As we are seeing more demand for these types of vertical size displays in the marketplace. We feel that they will also be big sellers for us especially in retail locations and in quick service restaurants for digital menu boards, where patrons as an example can see menu items such as a hamburger popping off the displays 10-15 inches prompting patrons’ sense of sight in addition to the aroma of food one smells when visiting a QSR,” Mike Egan, president and CEO of Exceptional 3D, said in the release. This entry was posted in Digital Signage. Bookmark the permalink.